In an Aquafarm, aquatic plants and animals remove waste products from the water. This leads to cleaner water that complies with the European directive for natural water. In addition, natural water purification can be combined with the production of raw materials, such as proteins and fats. The research shows that two organisms in the Aquafarm work well together: freshwater worms, which break down sludge particles, and the Azolla filiculoides, a floating water fern that purifies water by absorbing dissolved nutrients such as phosphorus. “But in the end we can add many more organisms, such as mussels, crustaceans and other aquatic plants,” says Leon Lamers, Professor of Aquatic Ecology and Environmental Biology at Radboud University and one of the initiators of Aquafarm. 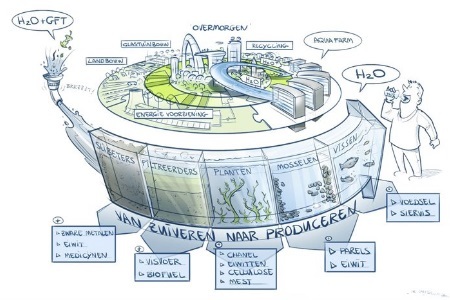 “The regional water authorities want to participate in a circular economy with Aquafarm,” says Lamers. The researchers are working on creating an optimised method of reusing waste: in addition to proteins and fats, it is conceivable to produce green fertilisers, fish feed, and adhesive coatings. In a trial at the sewage treatment plant Dodewaard, 400 kg of duckweed has already been harvested as raw material for glue production. The importance of sustainable water treatment is increasing. An example is medicine residue in sewage. This is now partly being removed by bacteria in the plants by chance, but to remove everything requires additional, expensive techniques. “If we don't gain more insight into the process soon, there will be too much medicine residue and other new contaminants in our drinking water,” says fellow researcher Tamara van Bergen. In addition to small-scale experiments at the Radboud University greenhouse complex, Aquafarm will work on the installation of a system at an existing water treatment plant in the years to come. “Large water surfaces mean new challenges, such as saving space by stacking and controlling infections,” says Lamers. In 2014, Aquafarm was the winning idea of the Waterwegen Dragons Den in which one hundred entrepreneurs, scientists, regional water authorities, and free thinkers presented opportunities for reusing the resources of the regional water authorities. The Aquafarm project is a collaboration between Radboud University, Radboud spin-off Research Centre B-WARE, Wageningen University, the P2 initiatives factory, and three regional water authorities.